The historic Base at Santa Cruz, South of Rio de Janeiro was 1st used by the Germans who begin to erect a monumental Hangar in 1934 and inaugurated in 1936 to house the huge Graf Zeppelin and later the Hindenburg. With the outbreak of WWII and the declaration of War with Axis Powers in August 42, the Brazilians took full control of the facilities. US Navy stationed several Blimps of Squadron ZP43 there until 1945. After months of negotiations, Vargas agreed in June 1941 to allow Panair do Brazil to construct a string of Airfields in North-Eastern Brazil, including Belém, Fortaleza, Natal & Recife, preserving the fig-leaf that it was a Commercial Agreement. Through a Secret contract, the United States War Department had financed Panair’s Parent Co, Pan-American Airways, to build Airfields and Bases running from the United States through the West Indies and the Guianas to the Coastal City of Natal on the Bulge of North-Eastern Brazil. Only an 8 hour Flight to Dakar (West Africa), the Natal Airbase became known as the “Springboard to Victory,” the most important supply Route for Troops, Aircraft, and Equipment to reach the Battlefronts in Britain & North Africa. The day after the attack on Pearl Harbour, President Getúlio Vargas held a Cabinet Meeting in which the Brazilian Government decided to declare its solidarity with the United States. Dr Osvaldo Aranha chaired the 3rd Foreign Ministers’ Conference in Rio de Janeiro in January 1942, at which the Countries of the Americas declared their solidarity with the United States and recommended that all South American States break relations with the Axis Powers. The United States Delegation worked for the adoption of a resolution which declared outright that the South American States decided to break relations, but Argentina, which was pro-German, opposed it. Brazil’s highest priority was to obtain Armaments and Military Training to defend itself from German Submarine attacks in the Atlantic Coast and potential threats to its Southern Border by Argentina, which remained sympathetic to the Axis Powers. Brazil’s Authoritarian Ruler, President Getúlio Vargas, became convinced by 1941 that the Allies would win the War. Vargas’s Government embarked on a program of close, but informal, co-operation with the United States to support the Allies and reduce Germany’s influence in Brazil. In the wake of the attack on Pearl Harbour, Brazil entered into a formal Alliance with the United States under the Washington Accords of March 1942. On February 16th 1942, German Submarines sank their 1st Brazilian Ship, the Buarque, soon after it left the Port of Belém with a Cargo of crude rubber and brazil-nuts, prompting Vargas to request protective Convoys and Artillery from the United States. It was clear that Cargos of strategic materials from Brazil would need Military Protection. In August 1942, German U-boats sank 6 Brazilian Passenger & Cargo ships off the North-Eastern Coast, killing many Civilians, including women and children. Submarine Attacks on Brazilian Commercial Shipping interrupted food supplies from Southern Brazil to the Amazon and the Northeast, causing serious food shortages. By the spring of 1943, the risk of attacks by German Submarines abated considerably, due to combined US-Brazilian measures to protect Brazil’s Coasts and the successful Allied Campaign in North Africa. Brazilian Merchant Ships from the South and Northeast could again travel safely along the Atlantic Coast to Belém with food and supplies for the Amazon. The Allied victory in North Africa in May 1943 effectively ended German Submarine activity in the South Atlantic, and Brazilian Ships could again travel freely from the South Coast to supply the Amazon. Although still useful, North American Bases on the North-eastern bulge of Brazil were no longer as vital to the United States after North Africa was secured by the Allies. Vargas’ Resignation on 29 October 1945 allowed the return to Democracy in Brazil with the 1945 Presidential Election. The Italian Airline LATI operated a Transatlantic service between Rome and Rio de Janeiro, which was a conduit for high-value goods (platinum, mica, diamonds etc. ), Agents and Diplomatic Bags. London instructed the British Security Coordination to do something about that. BSC was set up by a Canadian entrepreneur called William Stephenson, working on behalf of the British Secret Intelligence Services (SIS). Stephenson called his methods “Political Warfare”, but the remarkable fact about BSC was that no one had ever tried to achieve such a level of “Spin”, as we would call it today, on such a vast and pervasive scale in another Country. The Brazilian Government had connections to the Airline through the President‘s son-in-law, and it was supplied, despite the US State Department protests, by Standard Oil in the US, making official channels ineffective. To curtail its activities, BSC decided that it had to be closed down by the Brazilians themselves; sabotage would be only a temporary inconvenience. Thus, BSC constructed a forged letter of such accuracy that its authenticity could not be questioned even under forensic examination. The letter purported to come from LATI’s Head Office to an Executive of the Company stationed in Brazil. The contents included disparaging references to the Brazilian President and the US and implied connections with a Fascist opposition party, the Party of Popular Representation. A “burglary” of the Executive’s House was followed by a photostat of the letter being placed with an American Associated Press Reporter, who immediately took it to the American Embassy, which then showed the letter to President Getúlio Vargas. LATI‘s operations in Brazil were confiscated and its Personnel interned. Brazil broke off relations with the Axis Powers to join the Allies. 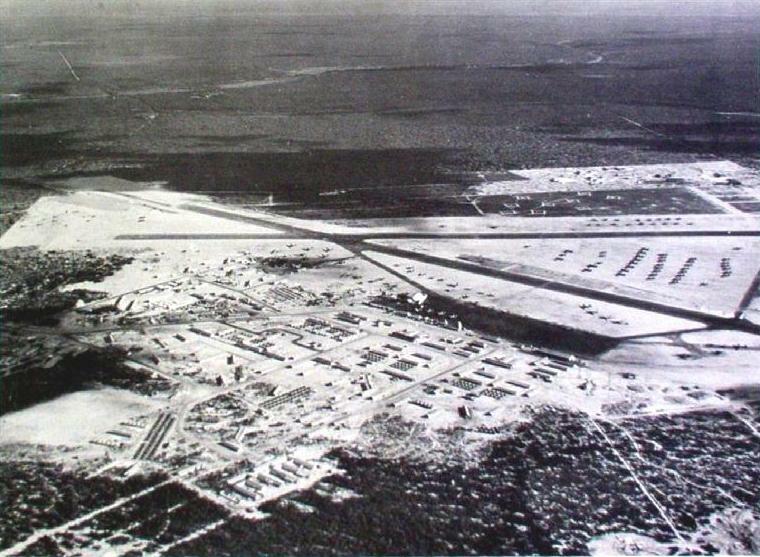 Recife AFB – 28th July 1945– Originally called Ibura Airport, the Airport had its name changed to Guararapes Airport in 1948. 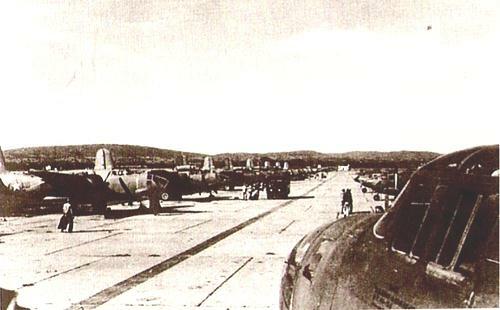 The Brazilian Air Force (FAB Força Aérea Brasileira) had its own Base at Ibura Airfield when it was created on 24th July 41. The same was activated on 23rd October that same year. Initially, the Base Garrisoned the 6th Aviation Regiment with Aircraft from Brazilian Army Air Corp. The 1st Buildings that formed the embryo of the Base were those formerly occupied- by Italian LATI and Air France. Both were closed by the Brazilian Government. In that restricted area, Brazilian 1st Air Crew operated from a small gravel Airstrip. With the time the hard work made a substantial modification in dimensions and the Facilities grew every day until it turned into one large complex with 2 distinct and Independent Bases; one Brazilian and the American operated by the US Navy and US Army. The 1st Aircraft detached to operate were 6 Vultee V 11 GB-2. Brazilian Air Force used 57 Aircraft of several types. Parnamirim Field, Natal. Dubbed “Springboard to Victory”, the largest US Airbase ever built outside America, was created in March 1942. With the arrival of US Air Squadrons, Natal grew in importance and space. From then on, 1000’s of Aeroplanes flew from Southern Florida reaching Natal before the long hop across the South Atlantic bound for Monrovia, Takoradi and other British Outposts in a gigantic effort to help the beleaguered British 8th Army in the Lybian & Egyptian Deserts. In Parnamirim Field the Brazilian Air Force based 45 Aircraft. The models A-28, B-25 and P-40 formed the GMA (Grupo Misto de Aviação). The recently created FAB, (Brazilian Air Force) occupied the Western side of the large Parnamirim Field. It was formally created on 2nd March 1942, and its activities effectively began on 7th Aug that same year. Thus all available Planes were transferred to the Base notably the AT-6B, that despite its shortcomings to the kind of Mission that required large endurance, they performed 100’s of dangerous and risky Patrol Sweeps & Convoy Coverage along the inhospitable North-eastern Coast achieving a high degree of Efficiency & Combat Readiness, a fact largely observed by the inhibition of Enemy Actions. Noteworthy to say that with the declaration of the “State of War” with the Axis Powers on 31st Aug 1942, there was an urgent need for an increment of Air Units to fill the gap of lacking suitable Aircraft so that an effective Presence of the Air Force could be seen in one remote, vast and still unprotected area.